A little more than six minutes into the game and we've had two game stoppages due to clock issues. Sheesh. Takes more than two guys to guard Nigel Hayes today. Need to attack Bryant. He's quicker than last year but shouldn't be able to stick with Hayes. #Badgers have failed to take advantage of IU's poor early offense. UW lead is 12-9 with 11:06 left in half. #Badgers lead Indiana 12-9 with 11:06 left in the first half. UW 4 of 9, Indiana 4 of 11. All of UW's points have come either in the paint (8) or as a result of FTs from work in the paint. Ethan Happ has 6 points and Nigel Hayes has 4 points. #Badgers shooting 44.4% from the floor. 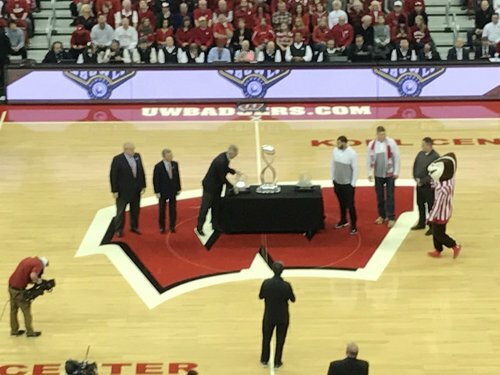 #Badgers Chryst, TJ Edwards and Fumagalli on hand with Cotton Bowl trophies. #Badgers Koenig was off with trainer. Limping again. Ethan Happ with 8 of UW's 14 points. More importantly he's 4-for-4 from the line. 14-9 UW at 10:48. Koenig went to the locker room with an athletic trainer, but he's back on the bench now. D'Mitrik Trice STICKS a 3! Ethan Happ with another big block, this one from behind on Devonte Green on a transition break. UW ball. Indiana timeout, down 17-9. 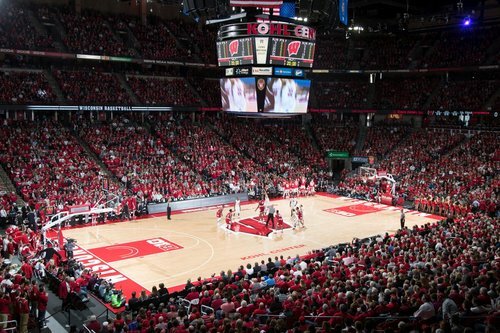 #Badgers up 17-9. Indiana averaging a little over 0.5 PPP. Hoosiers have six turnovers in 18 possessions. D'Mitrik Trice has been watching Melo Trimble with that head snap. I bet @bigtengeeks is pumped about that. Koenig back in the game, BTW. IU has no one who can check #Badgers Hayes down low. Hayes finishes off the 3-point play at the line. He's got 7 points for the #Badgers . #Badgers now 7-7 from the FT line. #Badgers Koenig back in. It's something he has to fight through. Keep playing zone, Wisconsin opponents. How many times do they have to see Hayes beat it? Wisconsin leads 22-13 with 7:55 remaining. UW with 12 of its points in the paint and 7 from the FT line. #Badgers up 22-13 with 7:55 left. Remember when Happ and Hayes combined for 56 pts at home last yr vs. Indiana? They have 17 combined today. IU's Davis just fouled #Badgers Koenig out near half-court line while trying to trap. Media time. UW 22-13 lead. In first meeting, #Badgers launched 20 threes out of 56 attempts. Today: 3 out of 13 FGAs are from deep. Wisconsin up 22-13 with 7:55 left in the 1st half. TB leads with 5 points after the ????. I would love to know what Crean's FitBit says after a game. Lots of standing/watching on offense by #Badgers . #Badgers have three assists and six turnovers. #Badgers Gard has seen enough crappy offense. Calls time with 5:06 and lead down to 22-18. Ugly game. Indiana is within 22-18 and Greg Gard calls a timeout. Four empties in a row for the #Badgers , with two TOs in that span. Timeout Wisconsin. Indiana rips off an 8-0 run and cuts the #Badgers ' lead down to 4. Happ & Hayes combined 17pts. Wisconsin's defense has been far from its usual aggressive performance. Lots of stagnate movement. 22-18 UW at 4:32.